This lively and stimulating book guides students through the historical contexts, key figures, texts, themes and issues in sixteenth- and early seventeenth-century English literature. 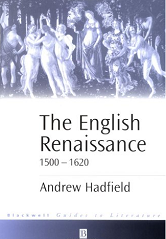 The English Renaissance, 1500-1620 sets out the historical and cultural contexts of Renaissance England, highlighting the background voices and events which influenced literary production, including the Reformation, the British problem, perceptions of other cultures and the voyages to the Americas.A series of short biographical essays on the key writers of the period explain their significance, and explore a variety of perspectives with which to approach them. In-depth analyses of a number of well-studied texts are also provided, indicating why each text is important and suggesting ways in which each might usefully be read. Texts featured include Astrophil and Stella, Othello, Utopia, Dr Faustus, The Tragedy of Miriam, The Unfortunate Traveller and the Faerie Queene.The volume charts the intricacies of English Renaissance literature, taking in a variety of themes including women, gender and the question of homosexuality; the stage; printing and censorship; humanism and education and rhetoric. Attention is also drawn to current debates in Renaissance criticism such as New Historicism and Cultural Materialism, thus the book provides students with an unparalleled foundation for further study.